The procurement functionality, as any others, has seen dramatic changes in recent years, becoming more strategic, more collaborative, and more technology-driven than ever before. Even though these transformative trends are still ongoing, procurement today is still quite recognizable to anyone who worked in the field a decade ago. One major trend in this area is the way of working, which has grown ever more closely. With the greater integration seen in maturing supply chains, a closer collaboration between all players in the value chain is required. Procurement teams, on the other hand, provide valuable input in terms of vendor negotiations, quantities, product specifications, pricing, discounts, lead times, and so forth. Finance departments take care of invoicing, managing all payments and collections, and checking that taxes and duties were paid correctly. All parties also collaborate closely with project management teams to ensure that the supply chain timing remains coordinated with project timing, as there’s no sense in having equipment delivered at end-user destinations without the required teams of engineers present to receive the goods and start integrating the products. The market pressure is creating an expectation on the part of multinational and multiregional organizations to be able to transact in smaller volumes, just in time. Whether internally within an organization’s own procurement department or through an e-procurement facility, organizations are also demanding end-to-end and self-service capabilities. Procurement service need to keep up with these demands and be able to offer seamless automation and integration with the suppliers but to a level with which the buyer is comfortable. The benefits mainly include greater efficiency, time and cost-savings through simplification and the elimination of process duplication. In a traditional system, a lot of the collaboration between suppliers and buyers has been lost or was slowed down due to limited transparency. Customers worked with many manual interfaces and error-prone processes. All of this made it difficult to identify new business opportunities. SAP S/4HANA delivers full transparency of process status per purchase order and invoice line items, real-time updates of business process information, increased process efficiency for buyers and suppliers. Which leads to another considerable improvement with SAP S/4HANA is the reduction in cycle time. Each action of a buyer or supplier refers to an object. Let us take a look at one example, the purchase order or the invoice. In this cases we talk about any outbound or inbound message that represents a kind of sub process of that specific collaboration process. 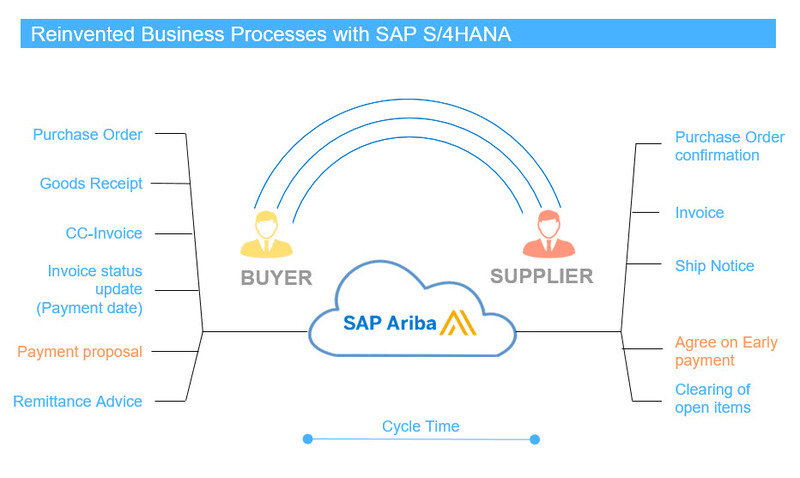 A very basic sub process here, with regards to the collaboration process of “Order Collaboration” is the creation of a PO that is, based on the system settings of the respective SAP S/4HANA Cloud solution, sent to the SAP Ariba supplier account, instead of being printed out. The supplier sees the PO in his PO list and can react accordingly. on the specifically agreed upon collaboration processes. In our example, the supplier can react on a PO by physically supplying his customer and after having sent the goods, he would just create and electronically send an invoice. DONE! The broader the collaboration scope, the more procurement and sourcing use cases for more and more material categories can run more efficient and digital. Overall we can say, that the operational overhead are getting significantly reduced and the business challenges as of today become eliminated. Stay tuned when we take a closer look into the technical aspects of the procurement functionality in the technical view blog. Thanks Sven. it is really good.. but how the innovations are measured in case of Procurement..